Samsung was the first manufacturer to release a truly affordable Blu-ray laptop and has continued this trend with such machines as the R720. Combining power and usability, this excellent laptop is a great choice for people looking for a laptop with the latest tech but want to save a few quid. With Blu-ray support still a luxury at this price, its inclusion here is impressive and allows you to watch the latest high definition (HD) movie releases. Although you cannot write data to recordable, high capacity Blu-ray discs, you can create your own CDs and DVDs with ease. The use of a large 17.3-inch panel ensures ample screen space for enjoying widescreen movies and viewing photos in comfort. While the screen does not feature a Full HD resolution, image quality is fantastic nevertheless and ideal for regular entertainment use. Multimedia usability is enhanced by impressive graphics performance. The dedicated ATi Radeon HD 4650 graphics provides ample power for frequent photo and video editing. As an added bonus, there is even enough power for basic gaming. Home and office performance is no less capable, with the high-powered, dual-core Intel P7450 processor making light work of everything we threw at it. Smooth multitasking is also possible. Due to its spacious screen, this laptop is a bit on the weighty side. Weighing 3kg, you won't want to carry it very far. Its 180-minute battery life drives this point home, offering limited mobility. 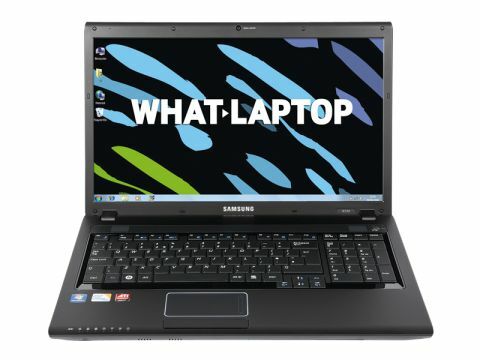 Samsung laptops often feature functional yet plain designs and this model is no exception. Using a combination of satisfyingly resilient glossy and matt-black plastics, the only element of design flair is seen in the blue highlighted touchpad, with lighting activating upon touch. Usability is excellent, with the touchpad's wide profile matching the widescreen panel. The keyboard is firmly fixed and provides a flawlessly smooth, responsive and quiet typing action. A full pad of number keys is also included. Rounding out the specification is a capacious 500GB hard drive, providing ample storage for large multimedia collections. Flash card compatibility is limited, however, with only SD Card support on offer, so bear this in mind if your digital camera uses another format. Offering Blu-ray support at this price is an achievement in itself, so when combined with such impressive performance and usability, the R720 barely puts a foot wrong. Only its limited mobility may deter some buyers, but as an affordable multimedia centre, this is one of the best.